L'hydrogénopersulfate de potassium ou peroxymonosulfate de potassium aussi connu sous l'abréviation MPS (pour monopersulfate) et les noms de marque Caroat et Oxone est le sel de potassium de l'acide persulfurique. Il est largement utilisé comme agent oxydant en chimie organique. Hangzhou Focus Chemical Co., Ltd.
Het is de actieve component van het drievoudig zout van kaliumperoxymonosulfaat, kaliumperoxomonosulfaat, de formule 2KHSO5•KHSO4•K2SO44. Kaliumperoxosulfaat (KHSO5) is het kaliumzout van peroxomonozwavelzuur en komt voor als een wit poeder. Er zijn 5 bedrijven waar deze stof wordt gemaakt: United initiators en DuPont. Zij produceren kaliumperoxosulfaat respectievelijk onder de naam Caroat en Oxone. Kaliumperoxosulfaat wordt vrij algemeen gebruikt als oxidator, vooral in de organische synthese. Het oxideert aldehyden tot de corresponderen carbonzuren en in aanwezigheid van alcoholen als oplosmiddel worden de corresponderende esters verkregen. Interne alkenen worden gesplitst in twee carbonzuren (vergelijkbaar met de ozonolyse) en alfa-alkenen worden geëpoxideerd. Thio-ethers worden geoxideerd tot de sulfonverbindingen, tertiaire amines worden geoxideerd tot amineoxiden en fosfines worden omgezet in fosfineoxiden. Oxone™ has been widely used in swimming pools and spas since the 1970s. Today, Oxone™ is the most widely used chlorine-free oxidizer in North America. Oxone™ is a powerful, chlorine-free product that uses the power of active oxygen to eliminate organic contaminants from swimming pool water. It's available as an easy-to-use, quick dissolving powder that goes to work immediately. It is important to note that Oxone™ is not a replacement for chlorine sanitizers. Chlorine sanitizes the water and protects swimmers against disease and infection. Using chlorine or other EPA-registered sanitizer is critical to maintaining the pool water. Oxone™ is a weekly shock oxidizer that works in conjunction with the sanitizer. In this role, Oxone™ reacts with contaminants that would otherwise consume your sanitizer, so the chlorine is free to do what it is intended to do: kill germs that can make you ill. When added to pool water, Oxone™ eliminates organic contaminants that are introduced by swimmers and the environment. These contaminants, which can include perspiration, sunscreen, dust, pollen and urine, cause water to become dull or hazy. 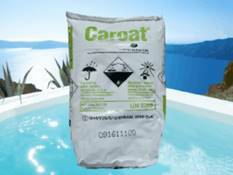 They can also create a heavy demand on sanitizing chemicals in the pool which leads to the formation of undesirable combined chlorine. Products that contain Oxone™ quickly eliminate these contaminants from the water. As a result, pool sanitizers actually last longer and work better to help keep your pool water safe. Oxone™ is the oxidizer of choice, whether the pool is constructed of gunite and plaster, vinyl liner, fiberglass, or painted concrete. It eliminates the need to shock with heavy chlorine doses which can bleach and fade vinyl liners and painted surfaces. Oxone™ can be added to pool water day or night, and swimming can resume after a short waiting period to allow for adequate mixing and dispersion throughout the pool. No mixing is required. Products formulated with Oxone™ are completely soluble in water and dissolve immediately; they should be used weekly for routine oxidation and also for special situations throughout the season. When there are no swimmers in the water, simply broadcast Oxone™ slowly and uniformly over the surface of the water, adding about two-thirds of the total dose over the deep end. Add with the filter running to ensure complete mixing and good circulation. Oxone™ dissolves quickly, so after 15 minutes of circulation the oxidizer will spread throughout the water and you can safely enter the pool. 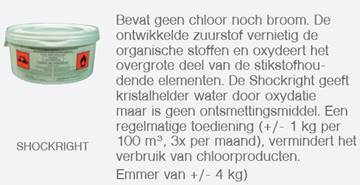 Read and follow the label directions on the product that contains Oxone™. LANXESS recommends regularly weekly oxidation with products containing Oxone™ to prevent problems, like cloudy water and burning eyes, before they start. Regular weekly oxidation with Oxone™ removes contaminants before they build up to the point where corrective action is required. With products containing Oxone™, the pool water is always clean and clear, and ready for swimming. Don't wait until the water becomes dull or cloudy, or until swimmers begin to complain of burning eyes, before shock oxidizing the water. It is usually more costly, time consuming, and labor intensive to correct problems than it is to prevent them from happening in the first place. Corrective treatments often start with adding a heavy dose of oxidizer, then waiting overnight for the oxidized debris to settle to the bottom of the pool. Next the pool must be vacuumed, and in many cases the filter may even have to be cleaned. During this process the pool is out of service. If you are currently using a chlorine shock product for weekly oxidation or corrective shock treatment, temporarily boosting the chlorine level introduces its own set of problems. When heavy doses of chlorine are added to water with organic material present, organic chloramines are formed. These chloramines, also referred to as combined chlorine, are the very compounds that irritate swimmers' skin and eyes, and cause that strong chlorine-like odor often associated with the smell of indoor pools. Shock doses of chlorine also raise the chlorine level above 4 parts per million (ppm) and swimming cannot resume until the free chlorine level drops back down to safe levels (between 1-4 ppm); this is called the "re-entry level." Fortunately, you can avoid these problems by following a preventive program that includes an EPA-registered sanitizer in conjunction with weekly use of a product that contains Oxone™ to keep your pool water sanitized and oxidized. A good starting point is to add an initial dose of 2 pounds of Oxone™ per 10,000 gallons of water and then oxidize weekly with 1 pound of Oxone™ per 10,000 gallons of pool water. The dose required and the shock frequency will depend largely on the bather load. Add an additional dose or a heavier dose of Oxone™ shock oxidizer when bather loads are extremely heavy (for example before/after a party) or following heavy rains or high winds. Oxone™ is also an ideal oxidizer to use during winterizing. 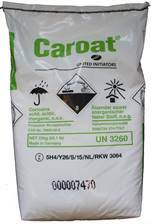 It removes contaminants and prolongs the activity of sanitizer residuals throughout the long winter months. Products that contain Oxone™ provide the oxidation necessary to keep water sparkling clear, so the chlorine is free to sanitize the pool. As a result the chlorine sanitizer lasts longer, so you can use less chlorine throughout the season. Oxone™ restores sparkle and clarity by oxidizing organic contaminants so that particles can combine more readily into larger particles that are easily removed by your pool's filter (a process known as microflocculation). In other words, Oxone™ renders the contaminants filterable, and by doing so, helps to improve water clarity. Plus, unlike other treatments that don't dissolve as readily and can cause your pool to remain hazy for hours, Oxone™ formulations dissolve completely and immediately without hazing the water. The harsh "chlorine" smell from some swimming pools, especially indoor pools, is caused by combined chlorine (chloramine), a byproduct of disinfection. Combined chlorine is formed when pool water is treated with large doses of chlorine to eliminate organic matter. When you shock oxidize with Oxone™ instead of chlorine, organic compounds are removed by the processes of oxidation and filtration, and because these compounds are no longer present they cannot be chlorinated to form smelly organic chloramine. Unlike traditional chlorine shock products, Oxone™ will not spike the chlorine level of your pool. So, you don't have to wait hours-or possibly even overnight-for the chlorine to return to a safe level (4 ppm) before you can get back in your pool. With Oxone™, you only need to wait 15 minutes to allow the material to dissolve and spread through the water before you can continue swimming. Routine use of Oxone™ removes the organic compounds before they can react with chlorine to form chloramine. That means more fun for you and the family, and fewer red burning eyes and no irritated skin. 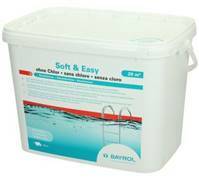 Soft & Easy is de complete zwembadwaterverzorging op basis van granulaat. Het bevat alle componenten voor een betrouwbare desinfectie, algenbestrijding en helder water. Daarmee worden 3 onderhoudstappen in 1 keer afgehandeld. 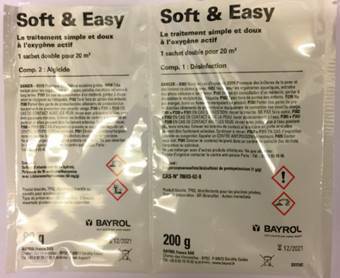 Soft & Easy bevat 2 algicide werkstoffen. Deze effectieve combinatie dekt een breder algenspectrum af dan gebruikelijke reinigingsmiddelen. Hierdoor is Soft & Easy ook een allround middel tegen algen. Het product is pH-neutraal, maar bevat speciale substanties voor het opslaan van pH, waardoor grote schommelingen van de pH-waarde wordt voorkomen. De toegevoegde hardheidstabilisator voorkomt het neerslaan van kalkdeeltjes. Voor een wekelijkse behandeling compleet en gemakkelijk, in kant en klare zakjes. Zonder geur, zacht voor de huid en de ogen. Waterstofperoxide 35%. 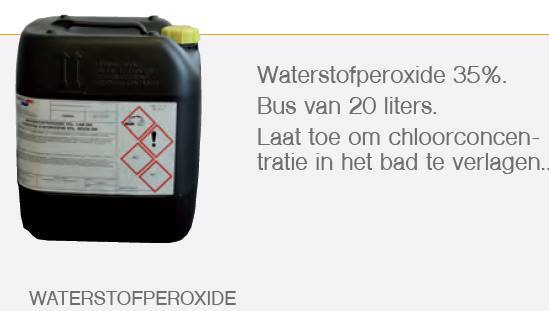 Bus van 20 liter. Laat toe om chloorconcentratie in het bad te verlagen.